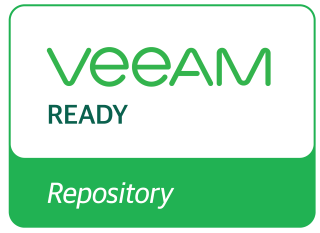 *This Veeam Ready test was performed with an SSD/Flash configuration. As such, this classification only applies to similar configurations in which the same amount or more SSD drives. The use of non-SSD drives may negatively impact performance. Both products (above) are share a common code base, implementation use case and license keys differentiate products. For this test, SANsymphony and Hyperconverged Virtual SAN were configured using a 10GB iSCSI SAN connection. However, all popular line speeds found in typical iSCSI SAN environments are available (e.g. 25, 40, 100 Gb/s). In addition, the SANsymphony family of products is also compatible with the Fibre Channel SANs as deployed in customer environments at all popular speeds (4, 8, 16, 32 Gb/s). See the DataCore technical support site for All Qualification and Host Configuration Guides (Previous hyper link references https://datacore.custhelp.com/app/answers/detail/a_id/838) to check DataCore Software's minimum pre-requisites in the General category and the Qualified hardware components in the DataCore Server category for more information. Note: The following settings were used by the vendor to meet Veeam Ready testing requirements and should not be considered best practices. Additional changes or settings may be needed to meet the storage efficiency or performance needs for each environment. For each setting, reference links are provided for further clarification.